Like many college students, Dan Mueller stands at a crossroads where he must choose a path forward at the University of Missouri–St. Louis that best reflects his personal interests while also allowing him to build a marketable skill set. Although Mueller could see himself as a police officer, politician or accountant, community leadership will remain a constant for his professional and personal growth. 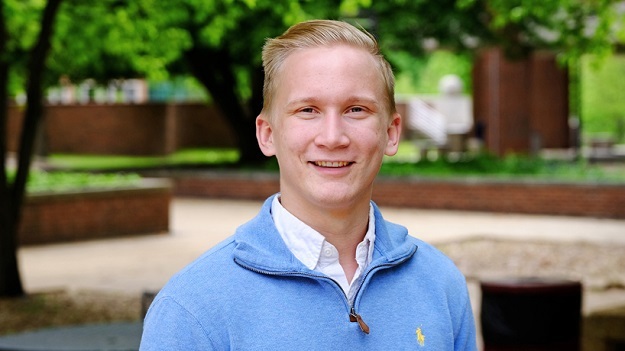 Making the most of his roles in UMSL Student Government Association, Sigma Pi, the Emerging Leaders program and the Pierre Laclede Honors College Association, Mueller has participated in the Altruistic Campus Experience project and the Big Event, among other community outreach programs. He has planted flowers at the Early Childhood Center, cleaned up abandoned properties in Jennings alongside the police department and mediated relations between students, faculty and staff. Campus Compact has recognized his years of community service and honored him with the Newman Civic Fellows Award, a national accolade that encourages undergraduate and graduate students who have taken action in pursuit of long-term social change.